This is the sixth and final part of a six-part series on the basics of creative surface embroidery, for beginners and those looking to refresh their hand embroidery skills and knowledge. Your embroidery is done, now what? If you had a finished product in mind, you’ll need to prep your embroidery for the next phase of that project, whether it’s sewing, framing or some other creative idea. If not, you might want to just leave it in the hoop as hoop art. Either way, you’ll want a piece of smooth embroidered fabric to work with. Fortunately, you can iron this style of embroidery with the help of a plush towel. Mollie Johanson explains step by step how to iron your finished hand embroidery on The Spruce Crafts. And that’s it. If you plan to frame your work, you’ll need to mount or stretch it on to board first. This can be done by some professional framers, or you can do it yourself using foam board. Trish Burr has a quick and easy method of mounting embroidery on to foam board using double-sided tape. Amanda from Wandering Threads Embroidery shows you how to mount your embroidery on to foam board using the lacing method. And Tanja Berlin of Berlin Embroidery Designs has a detailed tutorial on how to mount your embroidery for framing in a store-bought frame, with a PDF download of the tutorial for you to print and keep. Obviously, you can embroider pretty much anything you can sew. Plus a bunch of other stuff. Mollie Johanson explains how to embroider on T-shirts and other clothing made from stretch fabric. She’s also written about how to embellish your jeans with embroidery. Jessica Long from Namaste Embroidery shows you how to turn your hand embroidery into a patch. There’s some good advice on how to care for your embroidery – when washing and ironing the finished work, as well as while stitching – in Embroidery Tips, Tricks & Techniques, including an extreme solution if your thread colour runs into your fabric and you just can’t get it out! It’s annual sale time… everything in my Etsy shop is less 25% for four days from Black Friday on 23 November to Cyber Monday on 26 November. Each item will be shown at the sale price, so you just shop as usual. This includes pattern and ebook bundles, so you're effectively getting 25% off already reduced bundle prices as well. The sale runs for four days to give all of you around the world plenty of time to browse and shop, whatever your time zone. It's a good way to stock up on patterns for some holiday stitching or get any items you may have had your eye on at a lower price. This is part five of a six-part series on the basics of creative surface embroidery, for beginners and those looking to refresh their hand embroidery skills and knowledge. Stem stitch gives a smooth, neat line of stitching and works well on straight and curved lines. It’s my go-to stitch for outlines. Back stitch is another good embroidery stitch for outlines. It takes a bit on concentration to get your individual stitch lengths even, but is a good stitch to know as it can be used on straight or curved lines and is easy to work around corners or when embroidering sharp points. French knots are probably the most well-known embroidery knots. Ideally, you want all your knots to be a similar size and shape. Satin stitch is an easy way to fill areas of an embroidery design. It takes a bit of practice, but looks good and is a nice way to introduce solid blocks of colour into your embroidery. Good for lines and outlines, chain stitch gives a thicker row of stitching than stem or back stitch. It resembles the links of a chain, hence the name. There are so many great surface embroidery stitches out there. 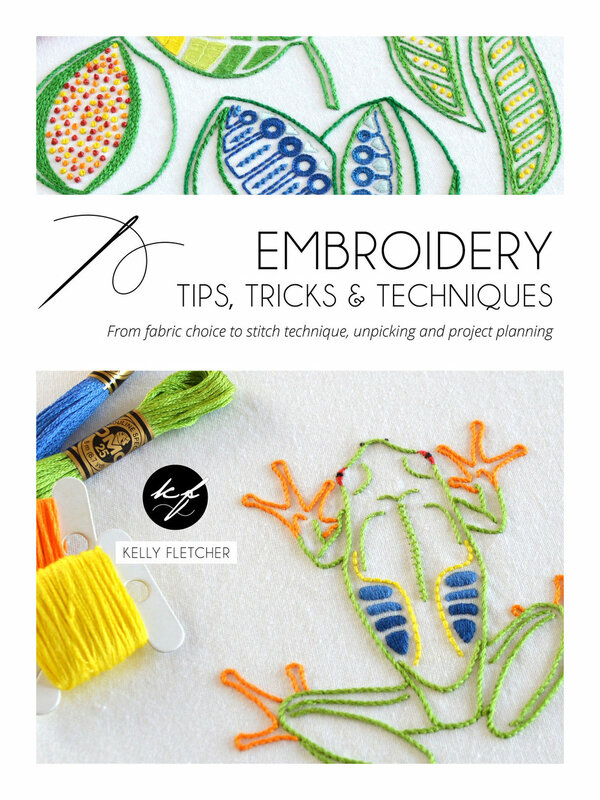 Master the basics and learn some of the more unusual or adapted stitches with 120 Embroidery Stitches, an ebook of written and illustrated, step-by-step instructions for all the stitches used in my books, kits and patterns. The convenient PDF format means you can save it to your phone or tablet for stitching on the go, or print it out and bind it into a paper reference book. This is part four of a six-part series on the basics of creative surface embroidery, for beginners and those looking to refresh their hand embroidery skills and knowledge. If you use backing fabric, the easiest way to secure your thread at the start is with a double stitch through the backing fabric only, directly under the line or section you’re about to embroider. A lot of embroiderers prefer not to use knots as they can create bumps on the front of your fabric or come loose if not done properly. I use knots every now and then, usually if I’m going to be embroidering or filling an area with French or other embroidery knots, when the bump a starting knot might create won’t be visible on the front of the fabric. I use a quilter’s knot, which is small and neat, and stays knotted. 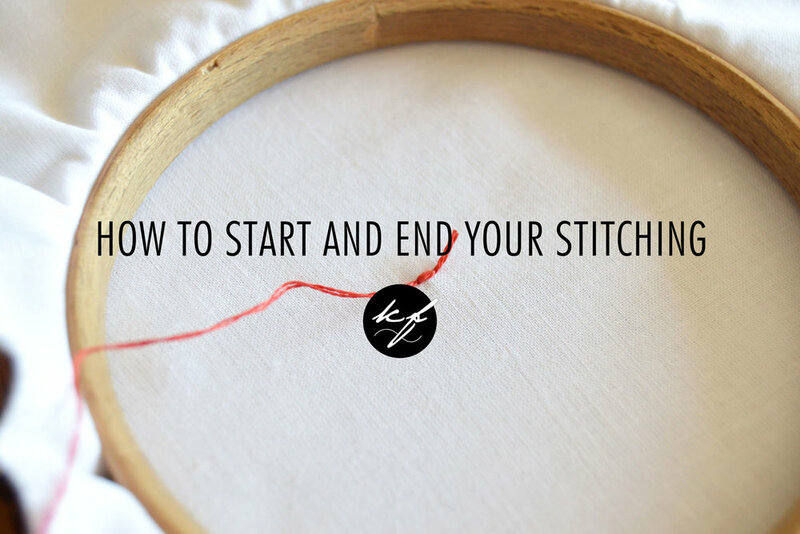 When you’re done stitching, take your thread to the back of the fabric and weave your needle in and out under the last few stitches before cutting off the excess thread. You can also whip the back of your stitching to secure your thread at the end of a row of stitching. This is done the same way you’d whip embroidery stitches. Mary gives some other ways to start and end threads for hand embroidery here. For more on starting and ending your thread, plus tips and techniques that make embroidery easier to do and allow you to enjoy stitching for longer stretches of time – that is, the nitty-gritty of ergonomics, light, visual aids, unpicking, dealing with knots and pricked fingers, tension and stitching techniques – see Embroidery Tips, Tricks & Techniques. This is part three of a six-part series on the basics of creative surface embroidery, for beginners and those looking to refresh their hand embroidery skills and knowledge. This is the easiest method, especially if you don’t have a lot of embroidery supplies. There are lots of options out there when it comes to pens and pencils: fabric markers from haberdasheries, water-soluble markers, Frixion erasable pens, ballpoint pens, pencils, chalk pencils… You’ll have to try a few to see what works best for you. Ultimately, as long as you can cover all the lines with embroidery, it’ll be okay! I use a pencil, the old-school type that you have to sharpen. This way, I can keep the point really sharp to draw as fine a line as possible, one that will be easily covered with thread. Print your design and tape it to a lightbox or a window. Then tape your fabric over the printed design, positioning the design where you want it, and trace over it on to the fabric. Double check that you’ve traced on all the design elements before removing the fabric from the lightbox or window. Dressmakers’ carbon comes in different colours, so choose the colour that’ll show up best on your fabric. You should get a sheet of white carbon paper if you buy a pack, which works well for transferring designs on to dark fabric. It’s widely available from haberdasheries and is usually reasonably priced. Lay your fabric flat on your work surface, place a sheet of dressmakers’ carbon face down on the fabric and your printed design on top of that. Draw over the lines of the design to transfer them to the fabric. Check that all the lines have transferred before lifting the printed design off the fabric. Jenny Hart has put together a step-by-step photo tutorial using her Sublime Stitching carbon paper. Iron-on transfers allow you to transfer designs on to fabric using a hot iron. You get commercially printed transfers in some kits, but you can also make your own using various iron-on transfer pens and pencils from haberdasheries and specialist suppliers. Reverse your printed design. You want a mirror image so it will appear the right way round on your fabric, especially if you have any text in your design. Trace the design on to tracing paper with your iron-on transfer pen/cil. Place the design face down on your fabric and press firmly with a dry iron. Slide your iron over the design, taking care not to shift the paper. It’ll only take a few seconds. Lift a corner to check that the design has transferred to the fabric before removing it completely. Jessica Long has created a handy flow chart to help you decide which transfer method is best depending on the project at hand. Dana Batho describes three ways to transfer designs to fabric, including using a commercial water-soluble stabiliser. Mary Corbet writes about a number of different ways to transfer designs, which she says is her most frequently asked question. And The Spruce Crafts has put together a list of seven transfer methods for you to try. Well prepped projects tend to be easier to embroider and end up looking better. Embroidery Tips, Tricks & Techniques takes you through the project process, from planning to fabric preparation, design transfer and embroidery, with tips such as which grade of pencil lead washes out easiest and why a roll of washi tape is a good addition to your embroidery toolbox!